Tough week running, but I’m happy to have survived. Same old stuff in the gym, keeping up with the weights and intervals pattern. Boring, but effective. I think. *Back up to a respectable number on the bench. Handled squats, rows and deadlifts with ease. *Hard work. Not really picking up speed, but matched last week’s speed only with 2 min less rest. *Cut weight by 50% and lifted well. *Proud of this one. I didn’t even want to run. *Ah, soreness there you are. *Miracle. Wanted to quit after four. Hamstrings were sore, but powered through it. Improving involves a lot of high-effort work with low-immediate return. No gratification most of the time. My plan this Spring is no different than the ones before in that regard. What’s new is that the focus will be on gaining strength, losing unnecessary weight and improving speed endurance. In short, weights, portion control and intervals. Still, progress comes so slow, and it’s disheartening. To drop a pound in a week, it takes 7 days, 21 meals, on-point, with few mistakes outside of those meals. To gain speed-endurance, it takes getting to the track and completing an interval workout either faster, longer or with less rest than before. To get stronger, it takes lifting a slightly heavier weight every week. Progress from week to week can be measured in seconds and pounds – with numbers less than five – most of the time. It’s hard to be patient with that kind of progress, especially when the mistakes (pizza nights, missing workouts) sets me that far back. Efficiency helps, but until someone comes up with a way that eating McDonald’s and sitting in bed makes people into four-minute milers, it’s going to take some discomfort and waiting. *Welp…traveling to California this week, so I’m going to have to be creative.Using YouTube videos of a husband and wife duo for the cardio days. Tried one when I got snowed in earlier this year. Surprisingly difficult. I couldn’t keep pace. Eager to try it again. On weights days, I’ll probably just hit 5 sets to failure on the pushups, sit-ups and squats, and call it a day. Not perfect. Maybe not even the best I could do. But it’s what’s going to happen. Workout: Warm [1 mile], 3 miles @ 6:36 pace Weather: 88 degrees, sunny. Just about found the right pace in these conditions. Opening mile of 3 felt pretty easy. Had to hustle a little bit to finish the run, but it happened. Very hot outside. I know I’ve done some night time runs recently in warmer temperatures, but there’s something about the sun that makes running a little bit rougher. Only 88 degrees (still shouldn’t be running in this), but plenty difficult. Hopefully, as it starts to cool down these tempo runs will get a little bit easier. 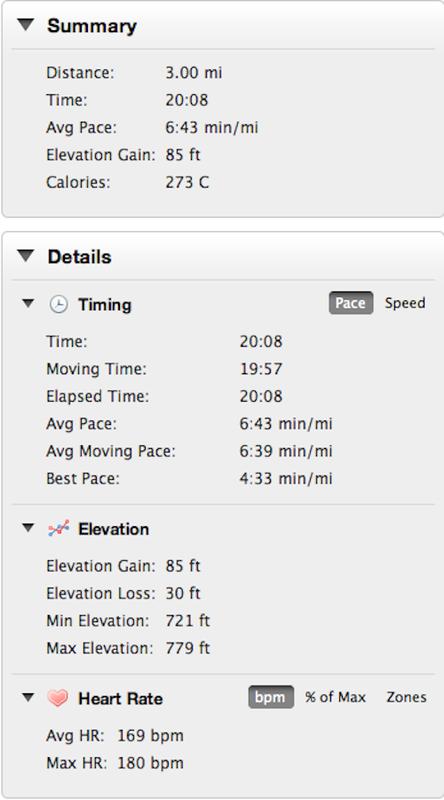 Still, never lost the pace today, and I’m proud of that. Next week is a 4th week (down week), so I’ll cut the distance down two. After that I hope to be able to complete these runs and do a full cooldown and form drill session afterwards. Just happy to finish today. On another note, I walked across a lady wearing a black shirt, black pants and cellophane underneath her shirt (and presumably pants as well). Looked like an attempt to lose a lot of water weight in a short period of time. She sounded like she was struggling quite a bit in the heat to walk around the park. I suppose I should have said something more than “Hello” and “take care.” We all have goals and places we want to get to, but it helps to be a little patient and safe. I suppose if I see her at the park again, I’ll say something encouraging. Workout: 3 miles @ 83 to 88%; core work. Weather: 66 degrees, rain. Recap: Planned to take another day off but couldn’t go through with it. Enjoyed running in the rain too. 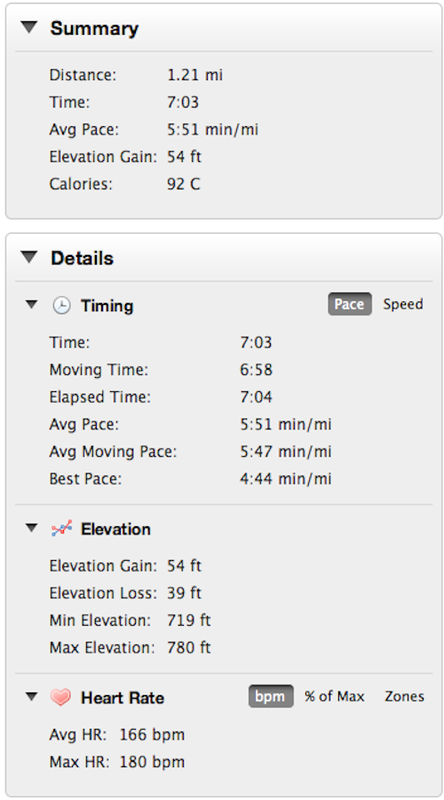 A run with heart rate limits like this helps me to understand what happens when I try those harder runs now. I can feel the pace slowing down as I hold in a certain zone. The legs get heavy, but on days like this I get to ease up at that point instead of trying to stay on pace. Patience. Workout: 1.21 miles @ 5:50 pace. Weather: 68 degrees, cloudy. Recap: Weather said 68, but it felt like it was in the 50s out there. Not complaining at all. Really enjoyed that. Lots of soreness in the legs though, so I’m cutting these runs short until they feel better. Good form out there though. Gotta be patient. With that said, it’s a pretty good time to think about things that are not running. I’d like to read a little more in the next few days. Get some new ideas. Think new thoughts. Should keep me occupied until it’s time to improve again on the roads. Nice to read blogs about people working through similar running issues and overcoming them. I’m a big fan of the “Posts I Like” feature off to the left. Keep battling.